Incorporating your personal style is an exciting part in the home design process. But before you choose ultra trendy finishes or an extremely traditional design, consider what is most appropriate for the long time value of your home. Incorporating your personal style is an exciting part in the home design process. But before you choose ultra trendy finishes or an extremely traditional design, consider what is most appropriate for the long time value of your home. Follow these tips to design a home that is personal to you, while incorporating elements that add value to your house. Design a home that will withstand the test of time. Focus on the location, and the quality of the construction, materials and design rather than building the biggest McMansion on the block. Monitor design trends to avoid using trendy materials that will likely become outdated. 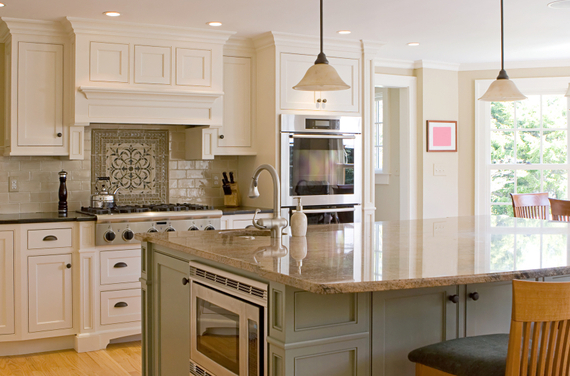 This is especially important for kitchens, which have the biggest return on investment. Consider appliances that blend into timeless, custom made cabinets, to avoid dating your space in the future. Investing your budget in the kitchen and bathrooms is wise, but don't forget to allocate funds for other high-impact areas of your home. Add elements of drama in unexpected places, such as the stairway. While often neglected during renovations, an eye catching staircase can make a big impact on the look and feel of the house. Investing in the closets will always pay off. Any opportunity to create more storage within your current space will add value. You may love the idea of bold red wallpaper in your dining room, but a neutral look is likely more appealing to potential buyers. When designing a home with resale value in mind, stay neutral. Benjamin Moore® Edgecomb Gray or Benjamin Moore® White Dove Tried are true neutral paint colors. Natural light is a always positive feature for any home. Show off your windows with high hanging window treatments. Window treatments that are hung between the top of the windows and the ceiling gives the illusion that the windows are larger than they actually are. Are you looking to expand your remodeling plans to the kitchen? Check out remodeling ideas for your living room.